The time has finally come! 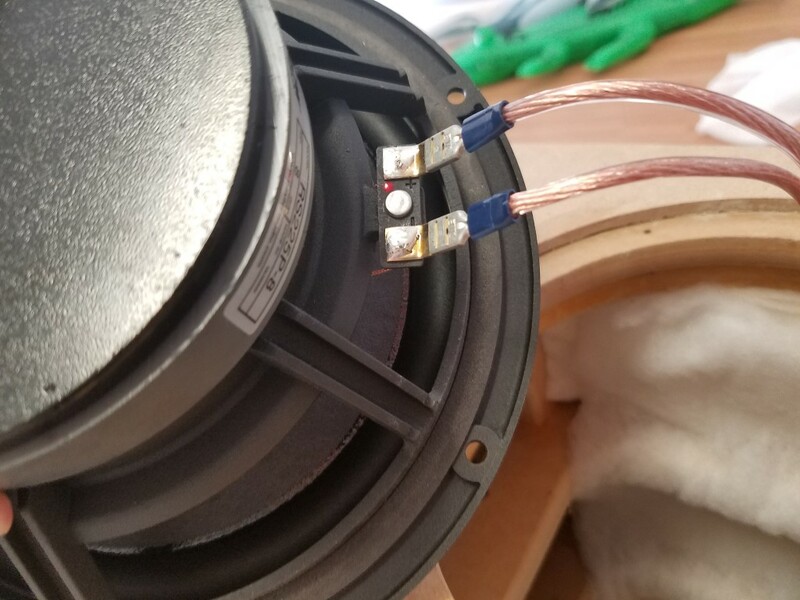 The moment when a speaker design has reached the stage where you finally get to install the drivers and have a listen to your masterpiece. 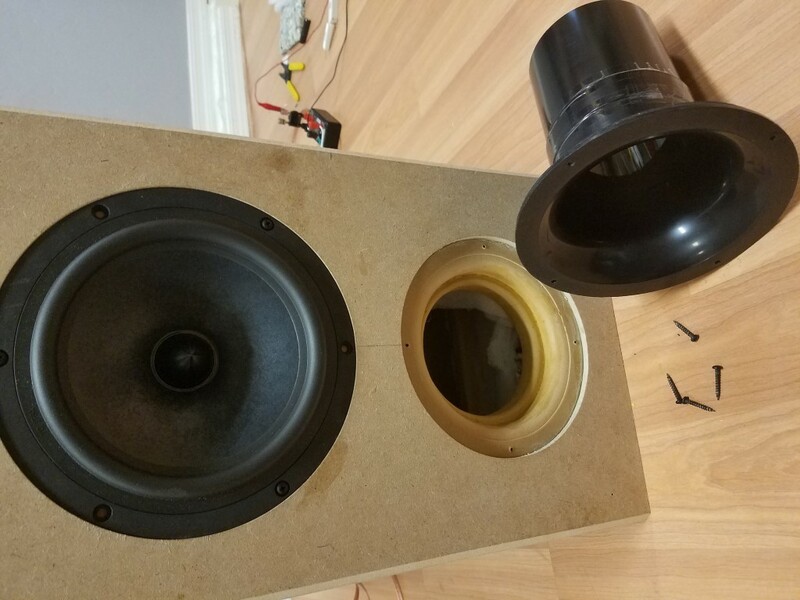 I have to admit, I struggled through this middle phase of building these speakers. 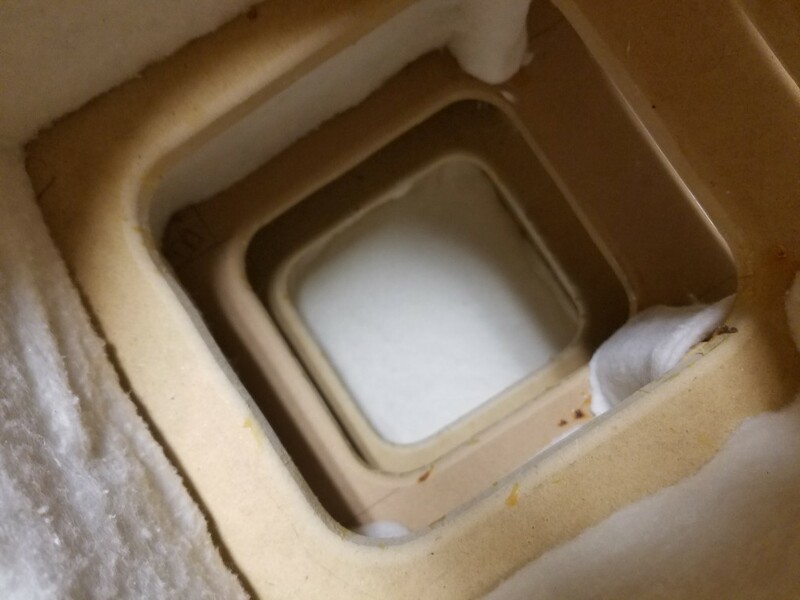 The part where I spent hours and hours tediously cutting strips of carpet pad, spray-gluing them into the cabinets, only to repeat the process with another layer of carpet pad and glue, then two more layers of a cotton/poly (80/20) blend fabric (and glue) and finally another two layers of 100% polyester batting and once again, more spray glue. This whole job just stunk. 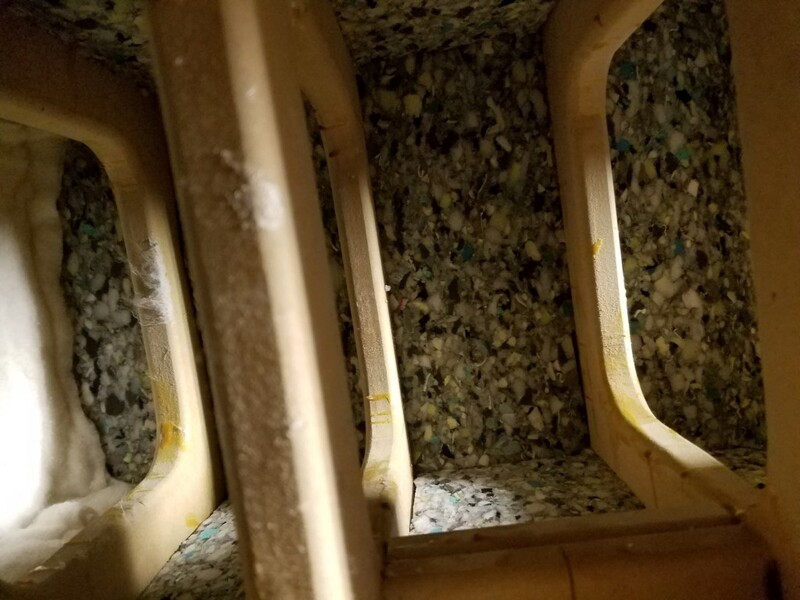 My garage was HOT (middle of summer here in AZ) the glue was sticky, it got all over everything, including me and halfway through the process I realized the glue wasn’t holding and all the pieces were coming off! Complete nightmare. 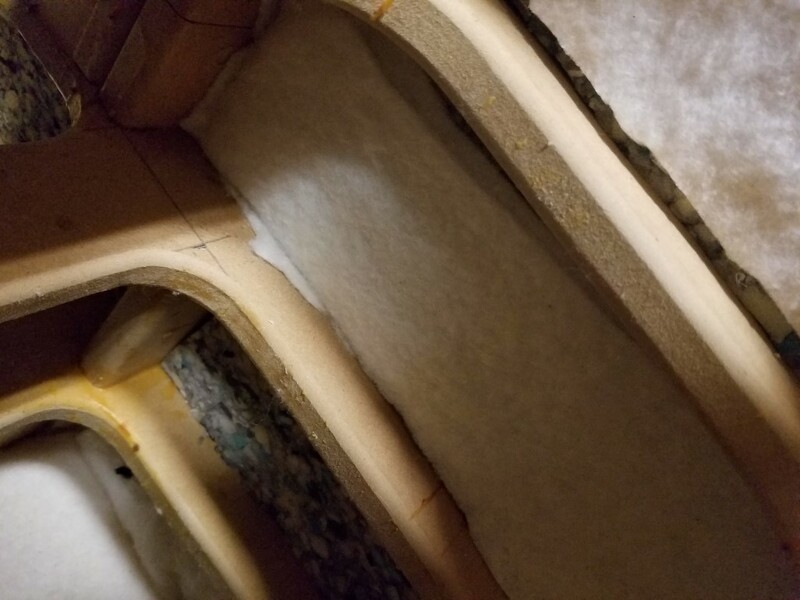 I remember the days when all I used to do was cut a big piece of fiberglass insulation and staple-gun it the box and be done, 1/2 hour job, tops. (Okay, I did that just recently, but still). 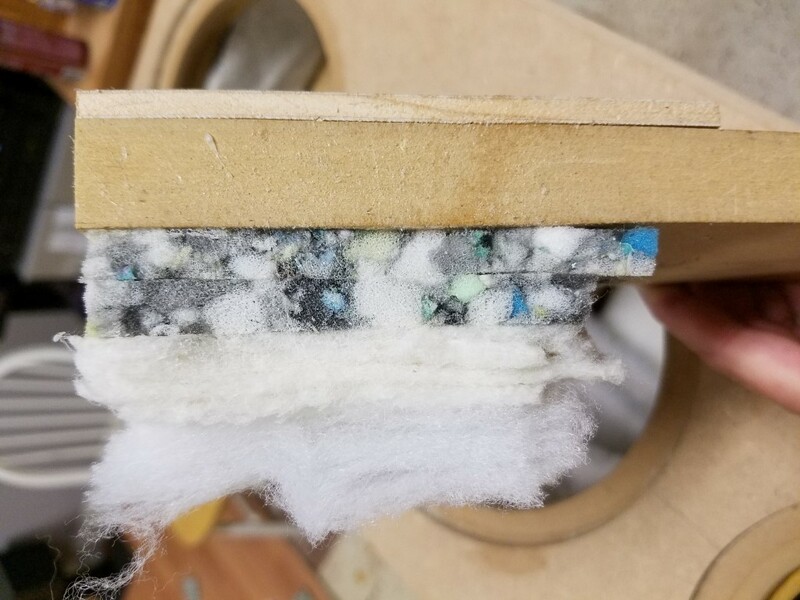 So I don’t know what I was thinking when I decided to do this whole multi-layer-different-material-glue job catastrophe. 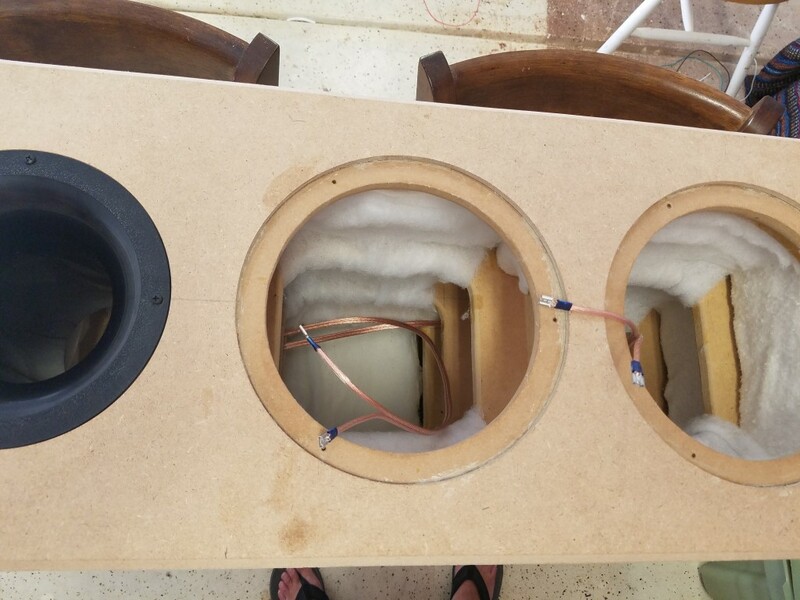 It didn’t help that each panel in the speaker is so compartmentalized, what with all the bracing every 4″ to 8″. Every piece had to be measured and cut to fit a specific location and then repeated over and over again. 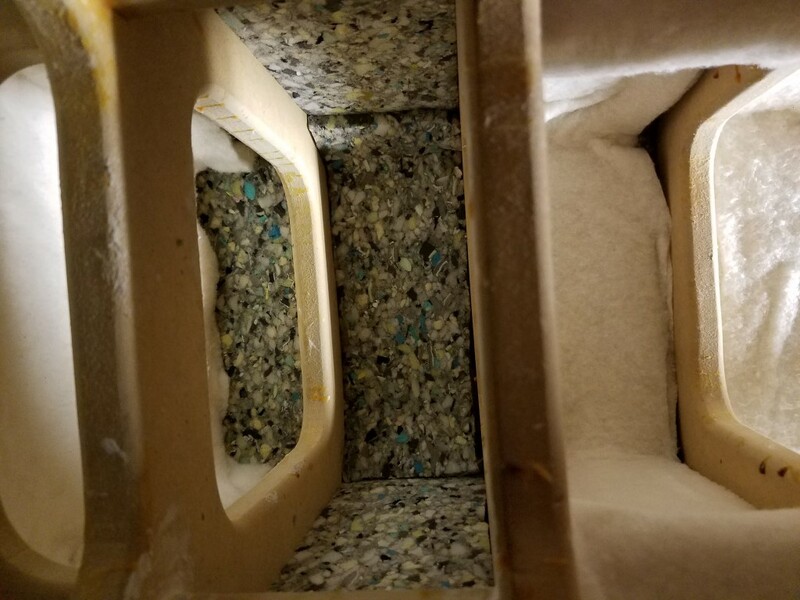 It was so stinking time consuming and honestly I have no idea if it’s any better or any worse than just putting a big wad of fiberglass in there. For the sake of argument, I am just going to say that it is better. 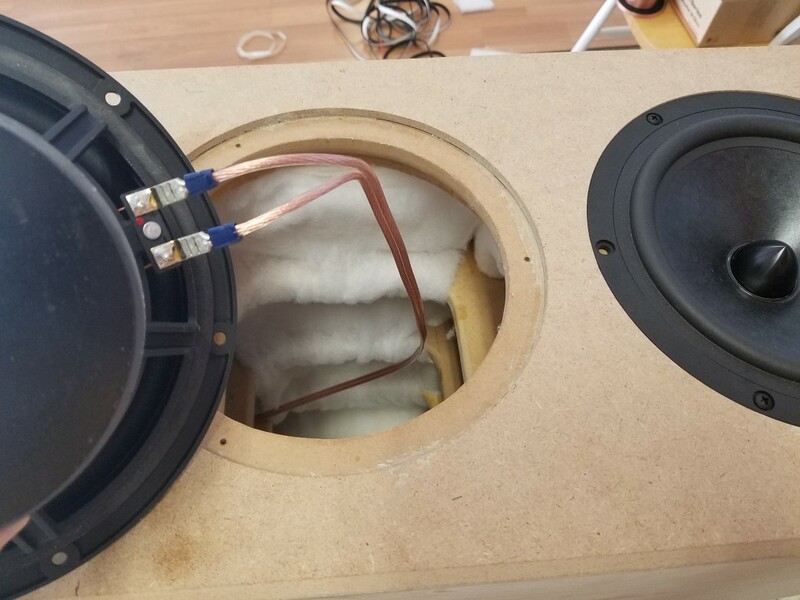 So much better than I am super excited to get to do it ALL OVER again when I build the upper cabinets for the midrange driver and tweeter. Yeah. The fun has just begun. So enough bemoaning, I chose this hobby, it’s my own fault. 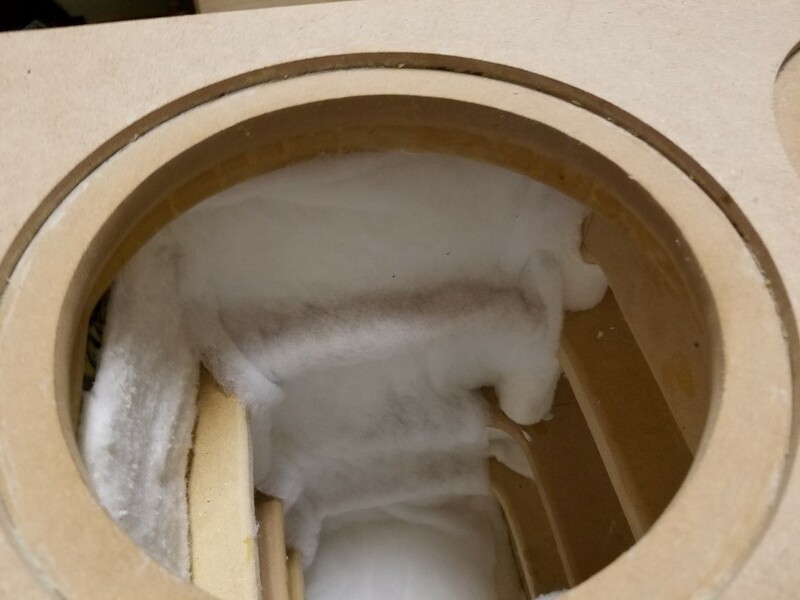 The basic idea behind the damping method was to start off with a relatively dense material up against the MDF and progressively use lesser and lesser dense materials working my way outward (or inward?). 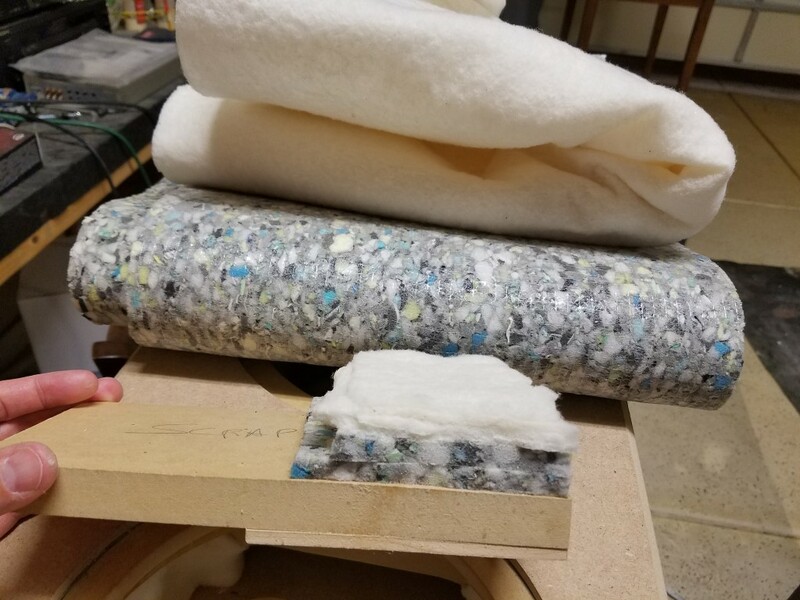 The idea being that in order to absorb the most bandwidth, I would need multiple different types, or densities of materials. There really is no one-size-fits-all when it comes to good broadband sound absorption. 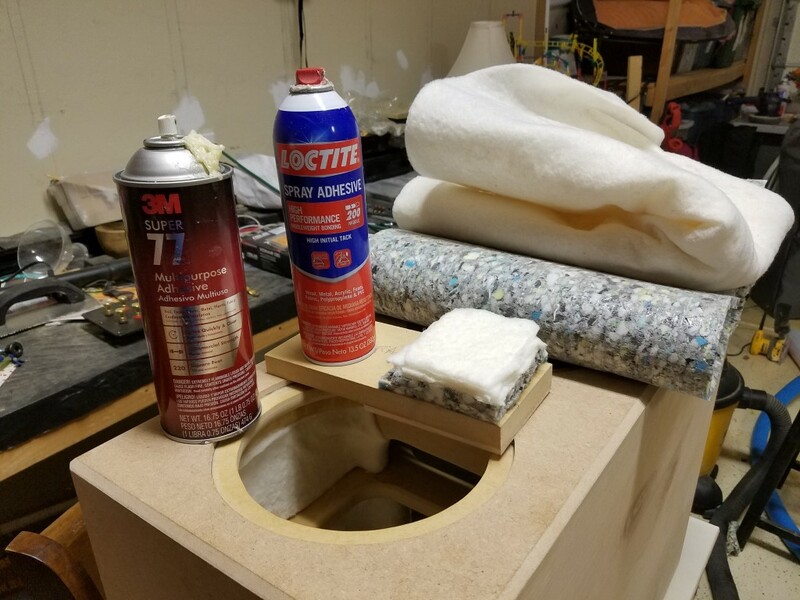 I started off with 2 layers of 6-lb carpet pad which makes up about a 3/4″ layer of sound absorption that I suspect does a good job in the low-to-mid frequency range. Next up I have the 80/20 cotton/poly fabric winch is also about 3/4″ thick. This was sort of an impulse buy but I liked it because it felt denser than the 100% polyester but lighter than the carpet pad. A perfect “in-between” weight for those “middle” frequencies. 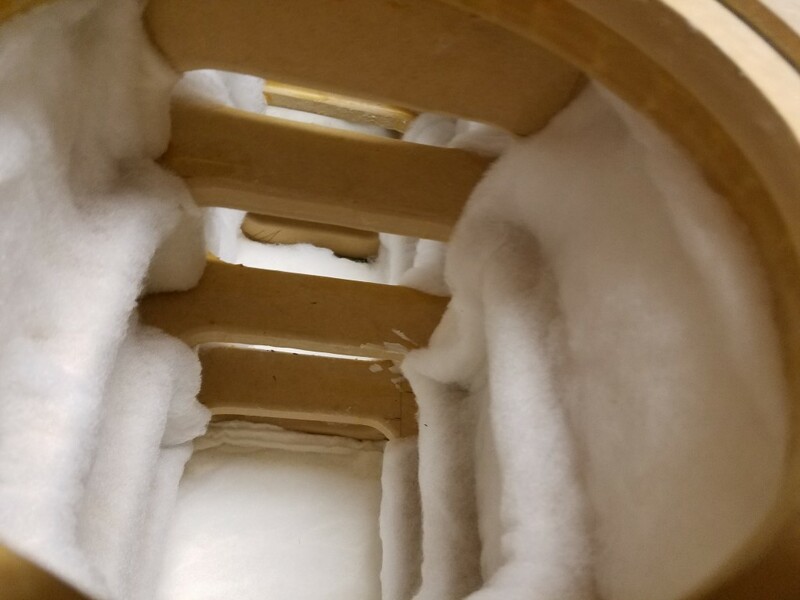 I used two layers on all the sides except for the back panels which has 4 layers. And last in the stack-up is the famous and favorite, 100% polyester batting. 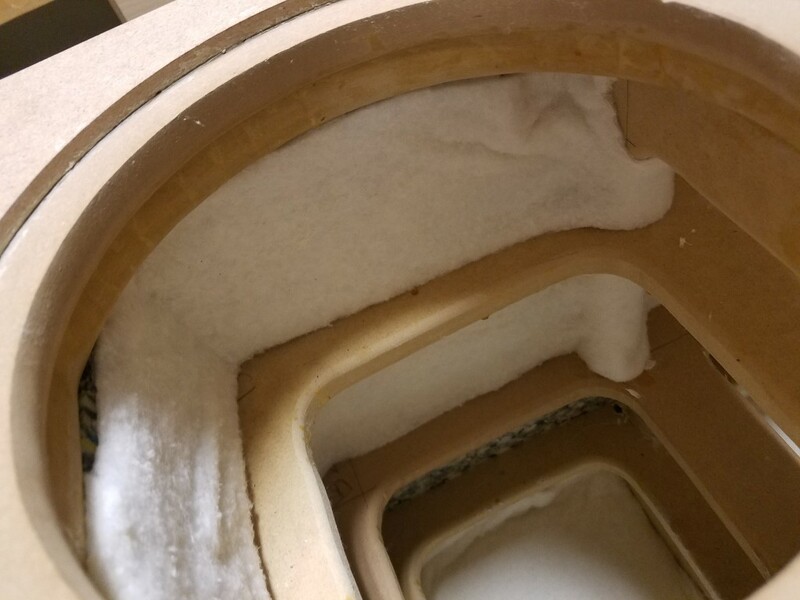 This material probably works well over a fairly broad frequency range and its effectiveness is more or less just dependent on how much you use. 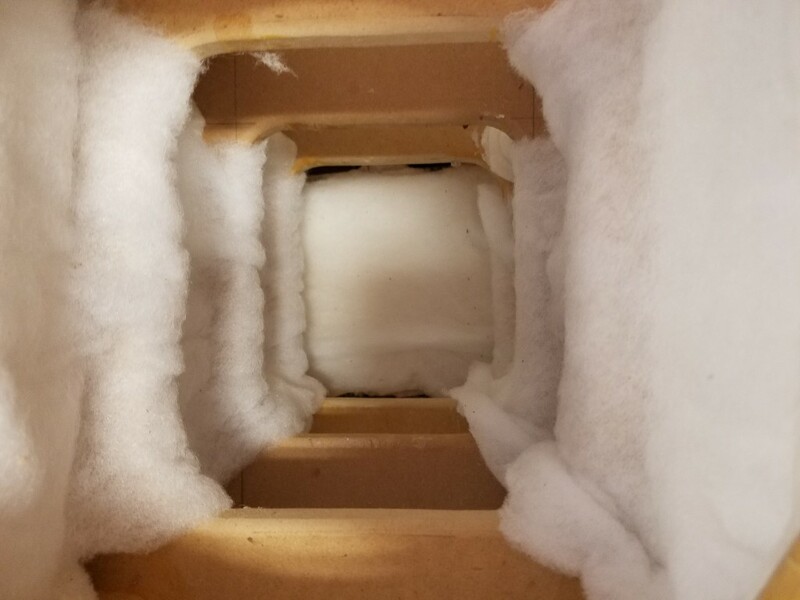 I lined what was left of the inside of the boxes with with another 2 layers (which looks more like 4 layers) of the polyester fill making up another 3/4″. 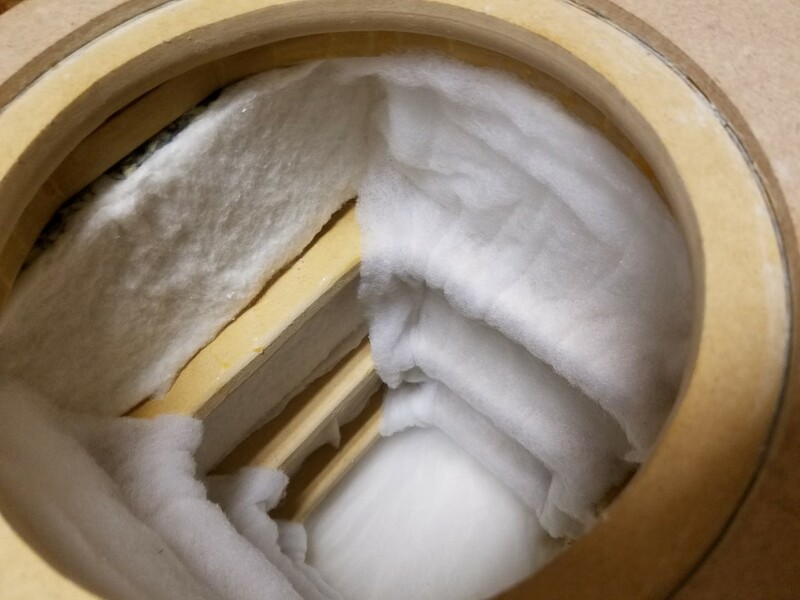 So in total the walls are lined with this custom-fabricated, multi-layer, sound-absorbing compound that is 2.25″ thick and should have good overall acoustic properties. 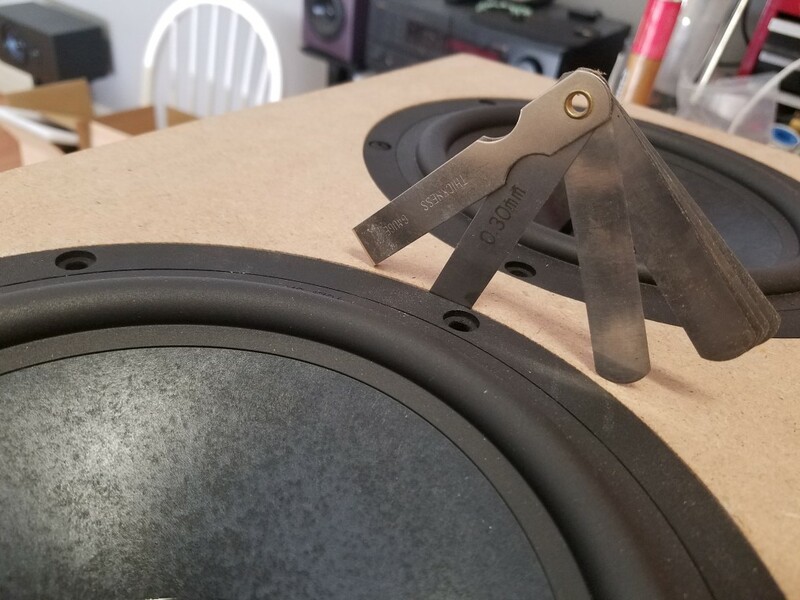 When you consider the wood in the mix, that’s another 1″ for a total of 3.25″ of sound-deadening, sound-absorbing action. 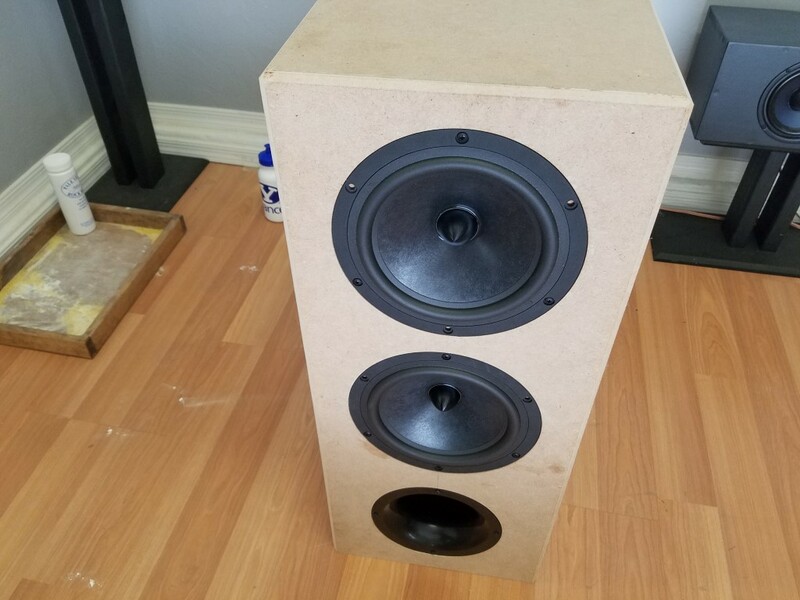 The only thing you will hear coming from these speakers will be from the actual drivers themselves. That’s the hope anyway. It’s a concoction all right, but it’s my concoction and I like it. One day I will recreate each layer in a sounds booth or something and measure them independently just to see what it really does. So along the way I did very unscientific sound checks with each new layer which consisted of me sticking my head in the box and singing different tones and simply listening for how much the boxes echoed or resonated. 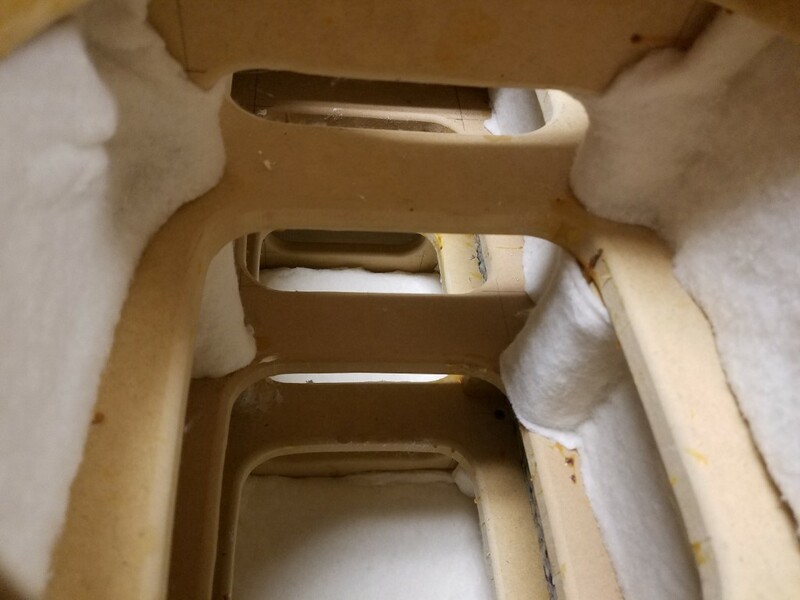 The boxes without any damping had a very apparent resonance in the mid-to-low vocal range. The lowest note I could sing, the boxes just resonated like crazy. Once completed however, the boxes felt very “dead” and had very little echo or resonance. 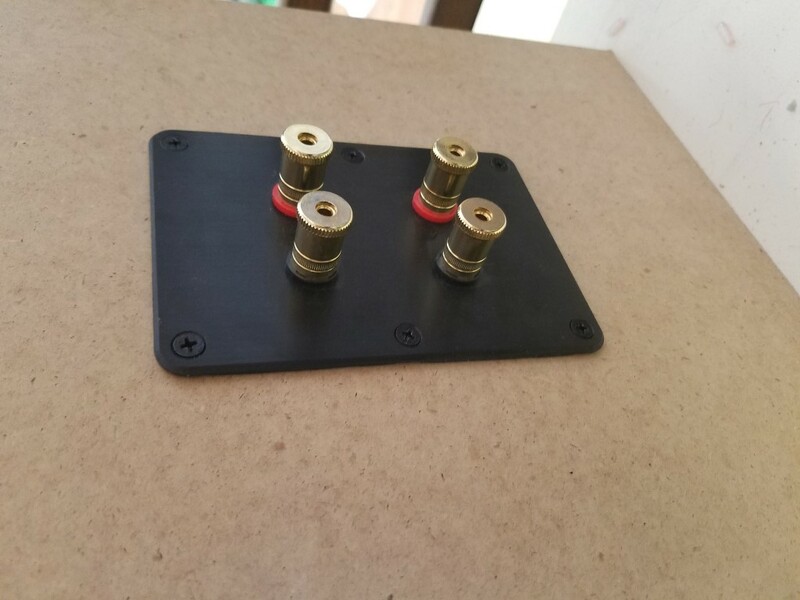 In hind sight, I wish I had measured the cabinets throughout the process, so I’d have something scientific to back up my damping technique, but like I mentioned earlier, I hated this part enough already, add in the complexity of trying to take frequency and impedance plots along the way, I probably would have gone crazy. 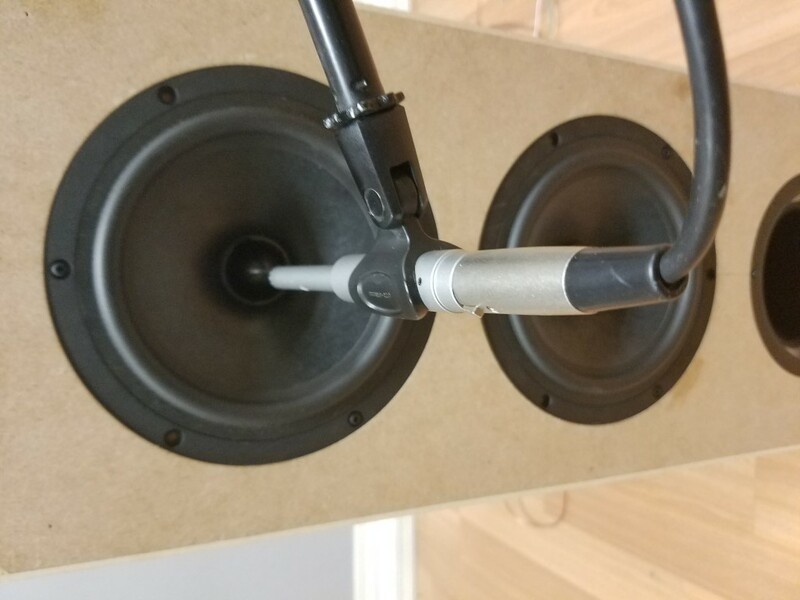 It seems like most people just take the trial-and-error approach to speaker damping anyway (me included) and so I fell victim to the same ploy, I guess, just out of shear laziness on my part. 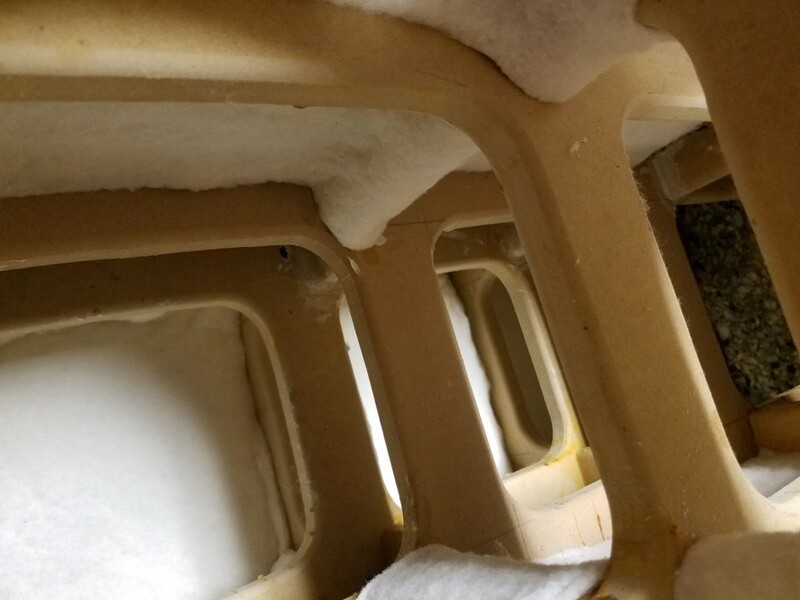 Sorry folks, but I will say this, this damping technique seems to have worked out perfectly in this 4th order cabinet to satisfy the requirement of “walls lined” and matching the corresponding Absorption (Qa) factor. To the best of my measurement ability, the measured frequency response and impedance plots line up very closely with the modeled performance. 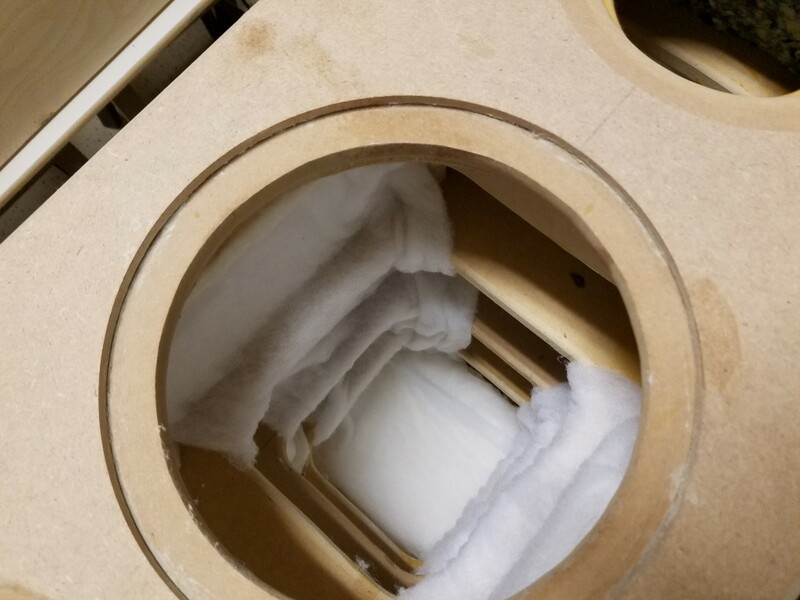 My plan is to carry this method into the upper mid/tweeter cabinet but instead of merely lining the walls, the entire cabinet will be filled with the 100% polyester batting in addition to the layers of carpet padding and cotton/poly blend fabric as previously defined. 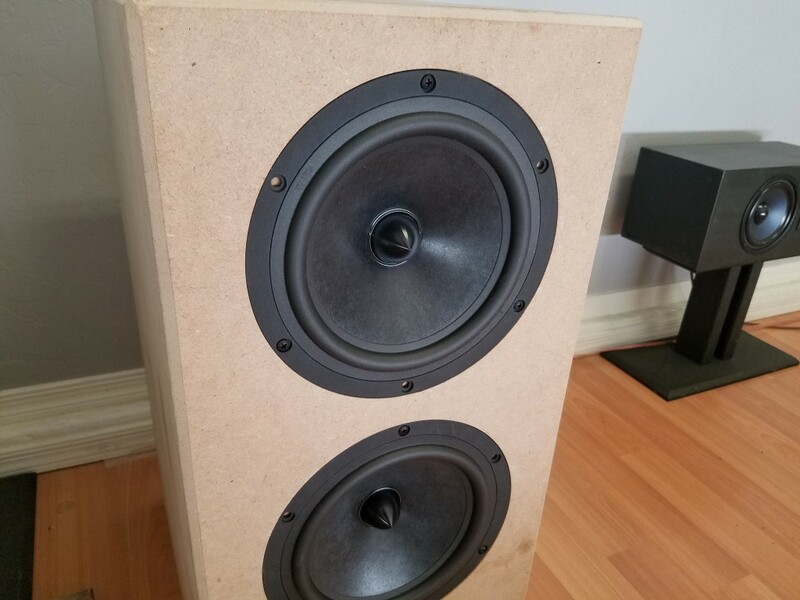 But since that enclosure will be sealed, and will have a high-pass active filter at around 300 Hz, I am really only looking for maximum sound absorption over a very broad frequency range and not too worried about over-damping or loss of bass response. So I am going to fill that cabinet up. Okay, so now it’s time to drop in the drivers and the port and take some measurements! For now the only measurements I am going to show is nearfield FR and impedance plots. 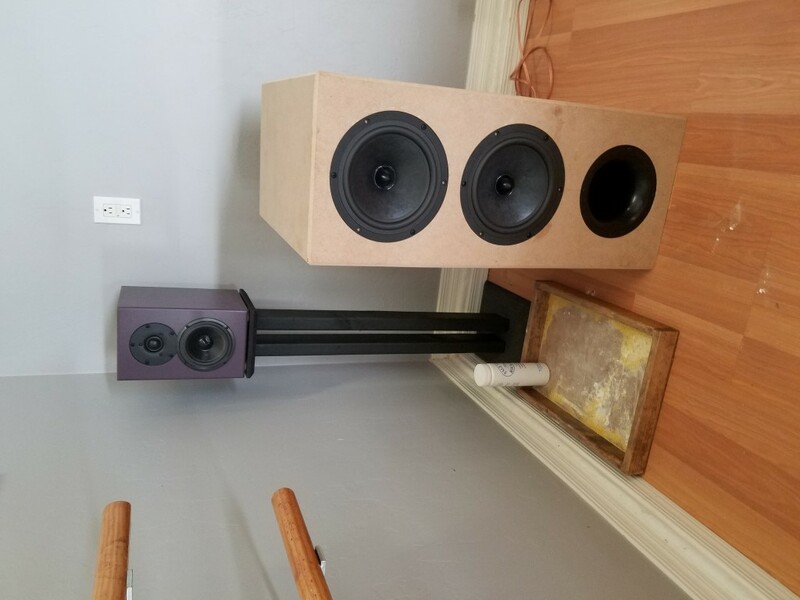 I have my entire setup in my garage and so room modes were apparent in all my measurements and I wasn’t in the mood to tear it all apart and re-build it outside in the backyard. That is coming, just not yet. 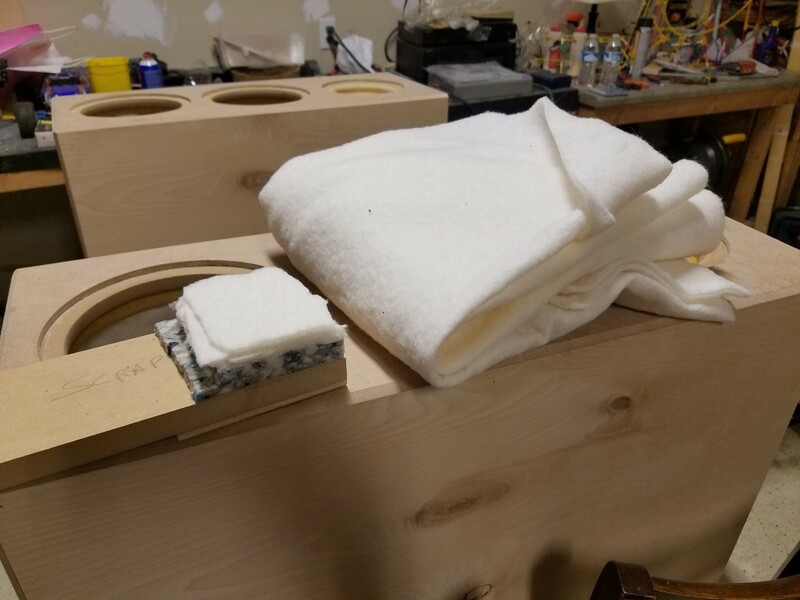 My main thing for now was just to do a quick check on the damping and tune the boxes so everything is as close to modeled as I can get before I stain and paint the boxes and call them done. And of course just to give them a quick listen! My measurement setup consists of an old laptop running REW 5.16, an ECM8000 microphone and stand, a Behringer 1202EQ Mixer (for phantom power) and a Denon AVR-1801 receiver (for the amp). This was the first time I had done actual impedance plots using REW and it worked out flawlessly. I love REW, it impresses me every time I use it! Thanks again to the guys who developed it for people like me. =) Impedance plots can serve several purposes: they show you box tuning, box damping, can reveal if there are leaks and of course, they show you the overall impedance vs. frequency of your speaker system. It’s more useful in that sense when combining multiple drivers and complex crossover networks, but even a simple 2-driver set-up it’s nice to see a solid 4 ohm impedance for two 8 ohm drivers in parallel. So what I chose to do was deliberately cut the port long and take measurements with progressively shorter and short port lengths just to show how the port length affects FR and impedance. 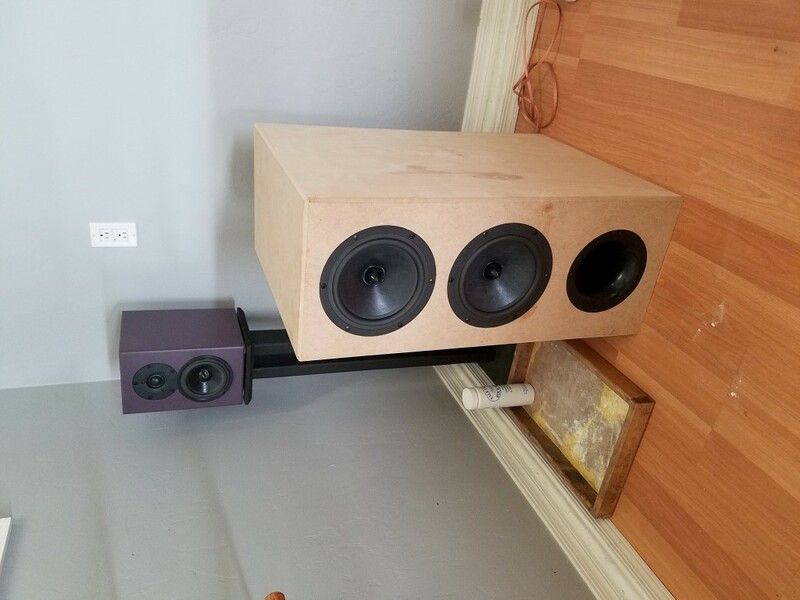 I didn’t really do any exhaustive listening tests since the speakers were being driven full-range and I was doing the measurements in my garage, which is not the final destination for these puppies. So as I mentioned earlier, the alignment I was shooting for in this design was a BE4 (Bessel) alignment according to Vance Dickason which should result in improved transient response (for a 4th order design) and has the lowest tuning of all the various alignment options. 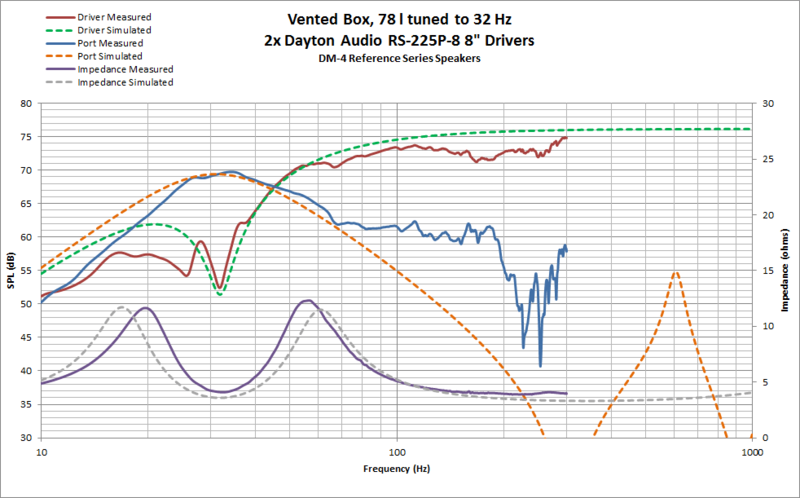 Which in a 78 liter enclosure is 32 Hz given the T/S parameters of the RS225P-8 drivers. So what the plots show is that for every inch I cut off the port, the enclosure Fb increased by ~1 Hz. 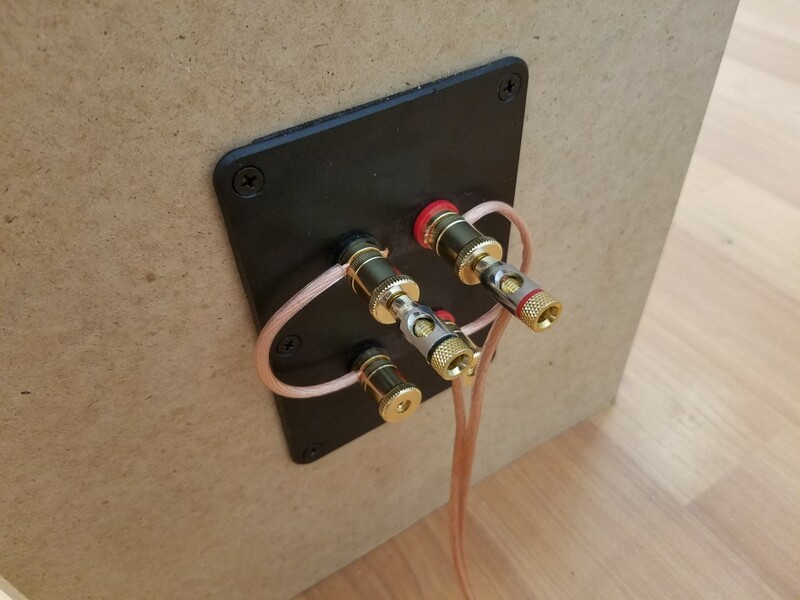 Enclosure Fb can be measured using the Impedance measurement tool in REW in addition to a 100 ohm resistor. Fb is located at the lowest point between each of the two largest impedance peaks. 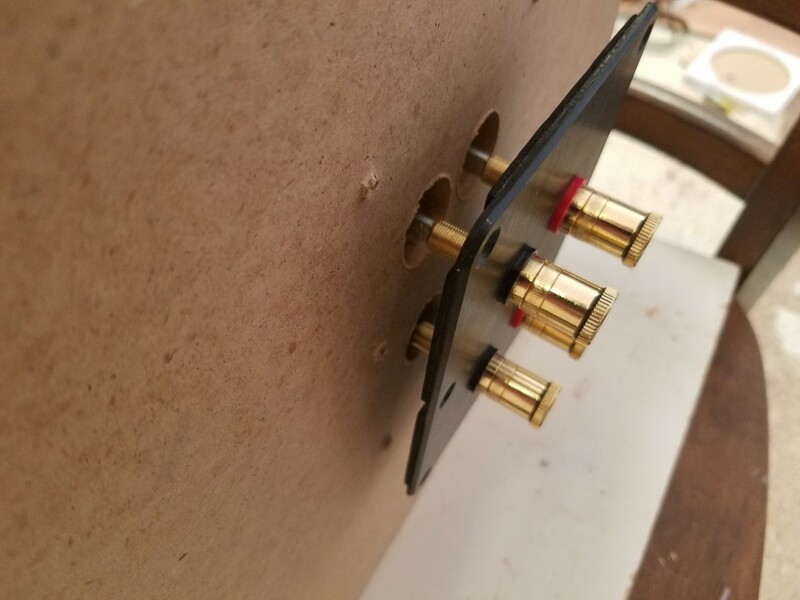 A more accurate way to measure Fb is to measure each peak, label them Fl and Fh and then seal or plug the port and measure the peak again can call if Fc. Then you can calculate Fb with the following equation: Fb = sqrt(Fl^2+Fh^2-Fc^2). 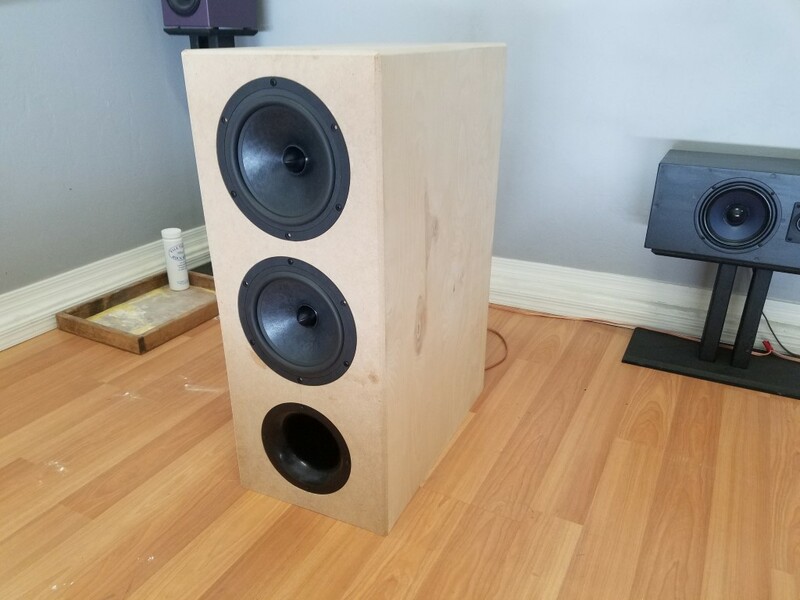 So I made 4 measurements with the port length starting at 10″ and ending up at 7″. The tuning corresponded by starting at 29 Hz and ended up 32 Hz in these tests. This can be seen in the impedance plots below. I am happy with the 32 Hz tune for now. 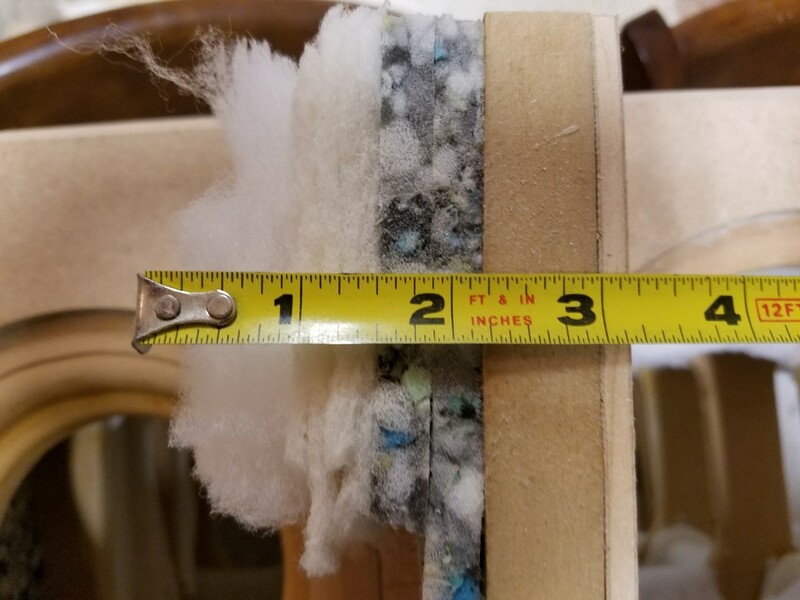 It represents the lowest tune that still fits within a classical alignment type and doesn’t give up too much in way of lower midbass extension. But it does not represent a flat response either, which would have needed to be tuned way up at 38 Hz with a modeled f3 of 43 Hz. That just wasn’t low enough for my liking especially considering how big these cabinets are. I’m a little disappointed that I won’t get extension into the 20’s. 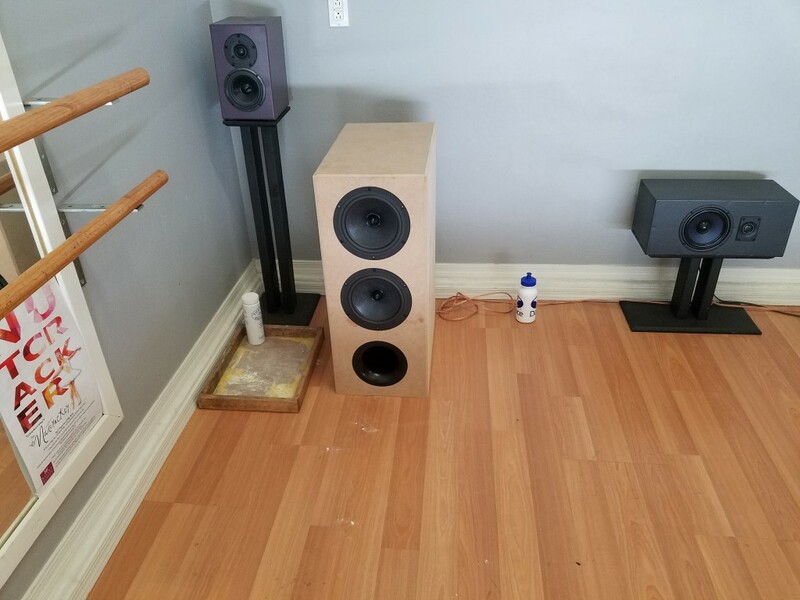 But that’s okay, because I already have a matching subwoofer in the plans to compliment this whole setup that will get me into the teens. 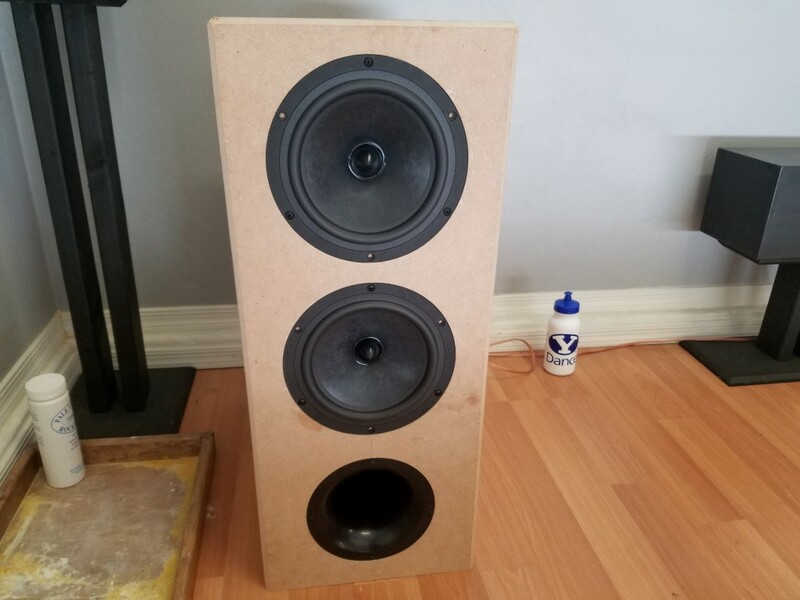 So there’s no sense wasting that low frequency stuff on these little 8 inch speakers. 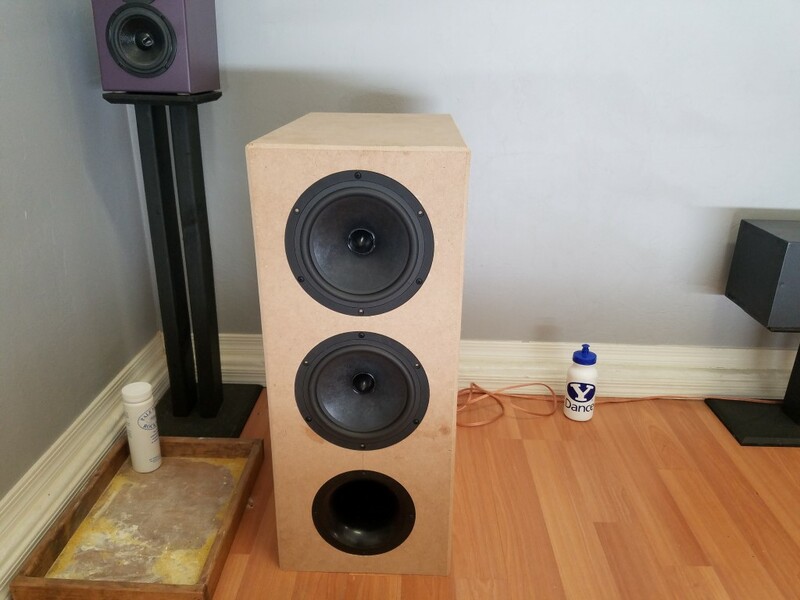 Besides, I did get a change just to play some extremely bass heavy music (just to break in the drivers a little bit) and even with a 32 Hz tune, they can drop some extremely deep bass. At one point my entire garage was bumpin’. 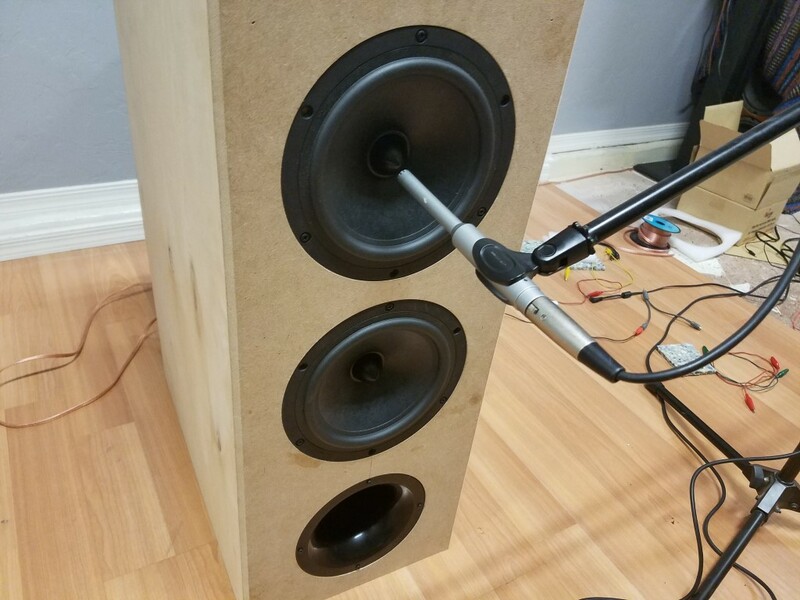 Of course, not the intent of these speakers, but they really sounded quite awesome. 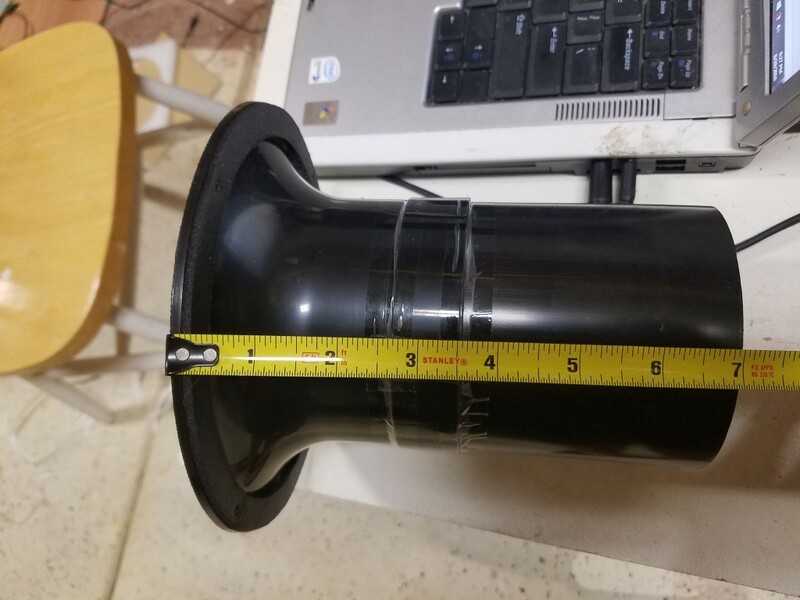 So I ran a whole bunch of frequency response plots with the speaker in the corner and in the middle of the garage, with the garage door open, near-field, mid-field, far-field, near the top cone, near the bottom cone, near the port, etc. There’s a huge room mode at about 25.5 Hz, which showed up in all the plots. That calculates out to be exactly 1/2 wavelength at 22 feet – the distance wall-to-wall in my garage. So I left it as good enough for now and will wait to do the measurements outside once I finish the upper cabinets. The frequency plots looks very good though. They match up nicely with the predicted responses as modeled in Unibox. See the Excel screenshot above. 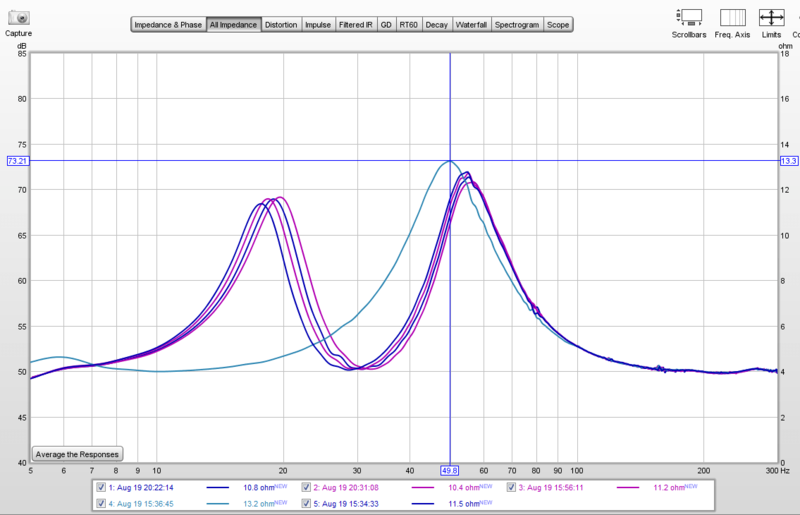 Even the impedance plots look very good as well. 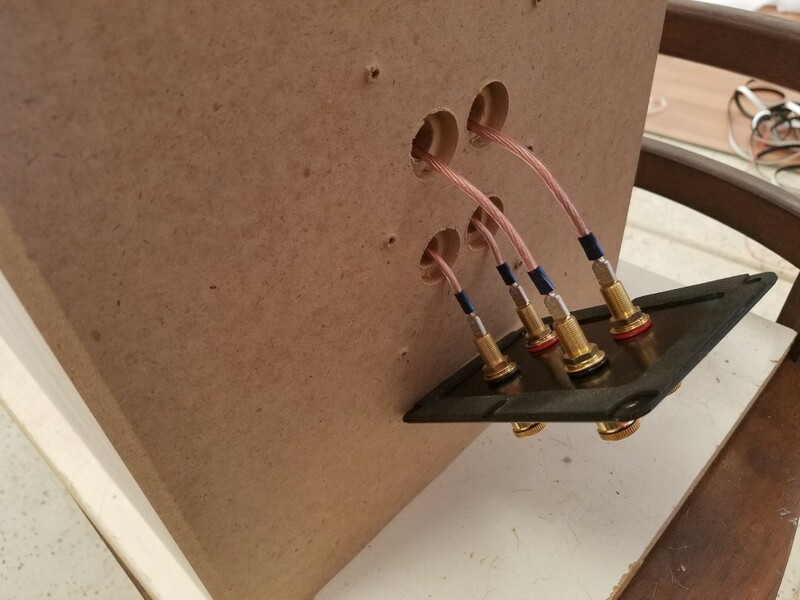 The impedance peaks are a little higher in my enclosures which suggests I do not have quite as much damping as the model, but that only means I can easily go up from here and add more as needed. 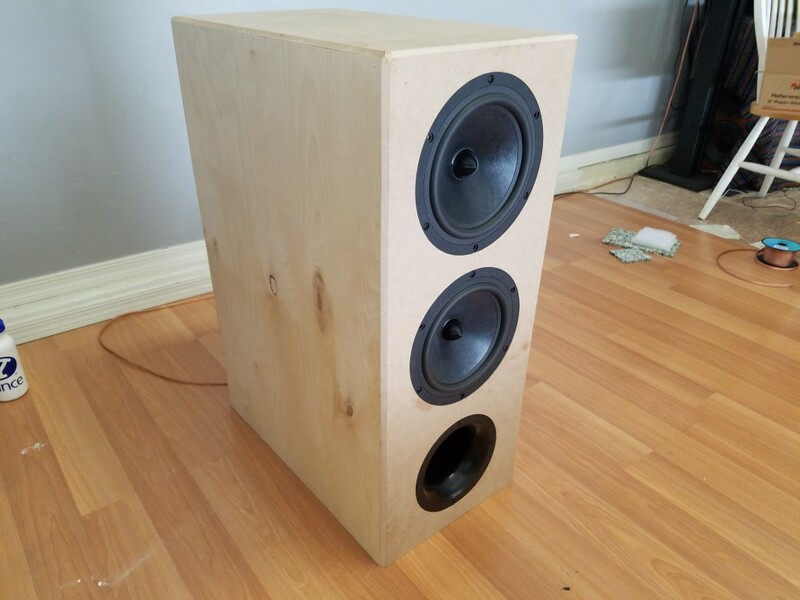 Besides, if I had to error on one side or the other, I’d rather be a little less damped and pick up some extra bass then to be overdamped and bass shy. So that’s about it for now. 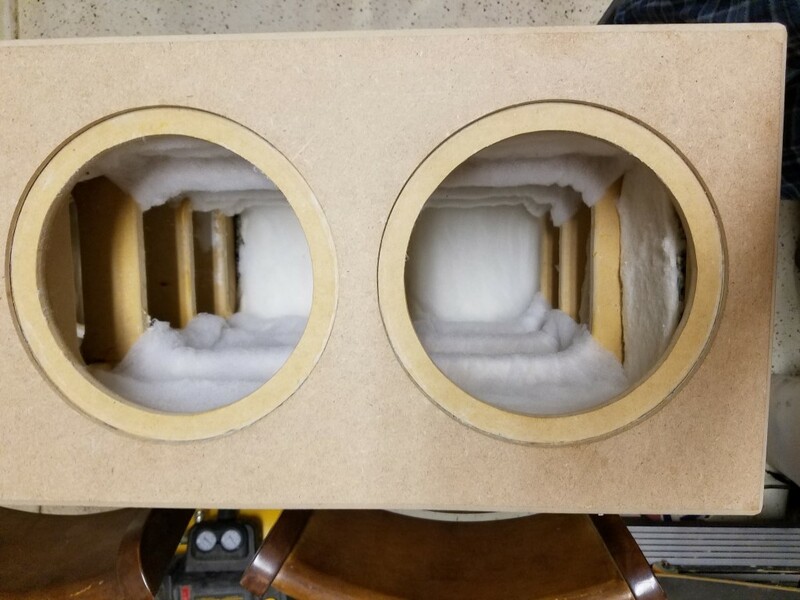 The plan from here forward will be to start the upper cabinets for the mid and tweeter. I have finally finalized the design and am ready to start cutting wood! I’ve got the materials all ready to go, I just need a nice long weekend to get to it. Hmmm, wonder when that will be? I’m thinking probably Christmas. That way it’s cooler outside and my garage won’t be a sweat shop. Enjoy the photos until then! And of course the cheesy Google video montage. For a complete biography, stop by www.danmarx.org and click around for a while. This entry was posted in Audio/Video. Bookmark the permalink. 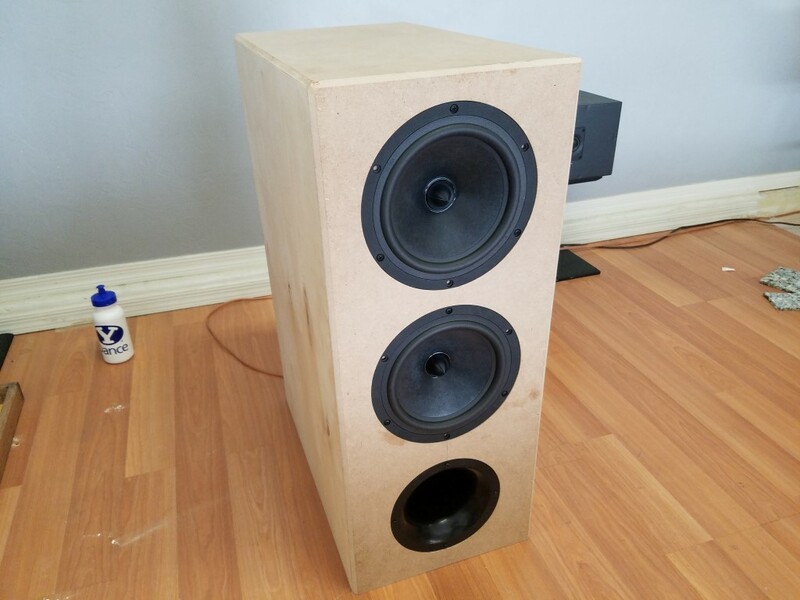 DM-4 Reference Speaker Build Part V – Finally Complete!